Today, everything is connected. Whether it’s a vehicle fleet connected to a central server, digital signage scattered throughout the city, point of sale devices at distributed retail locations or simply the primary network at a company’s headquarters, uninterrupted network connectivity is paramount to the continuity of any present-day business. A single network outage lasting a mere few minutes or more can cause panic – and real catastrophe during longer outages – as modern businesses simply cannot operate while the network is out. In a recent article, I discussed how distributed enterprises with branch offices can mitigate risks associated with network outages, including potential revenue loss, damage to brand and customer satisfaction, increased security and fraud risks, halting of business operations, and inaccessibility to your network and data. Where wired Internet access may not be possible or the best choice, wireless connectivity can keep machines and processes connected, branches linked and transactions flowing. 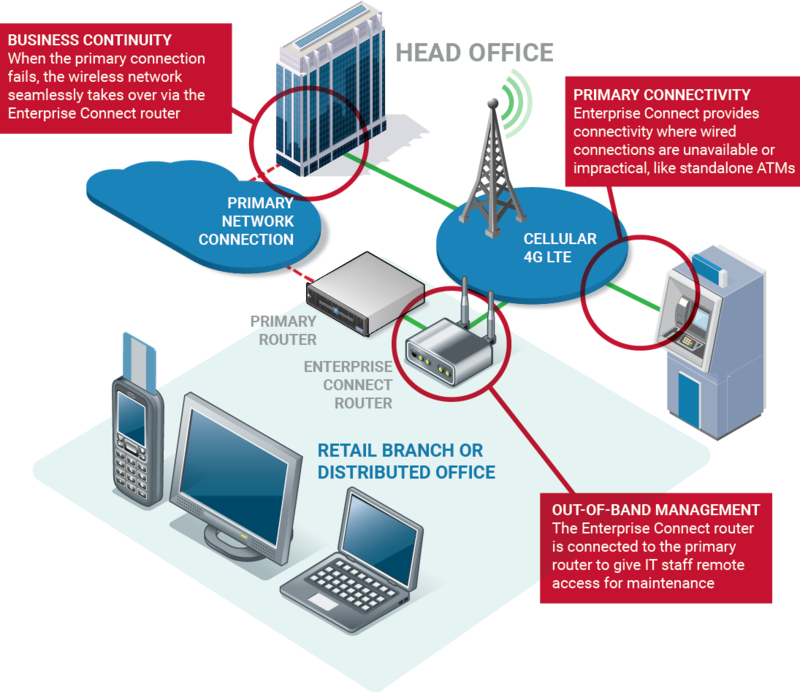 ORBCOMM Enterprise Connect launched last year to help businesses stay connected though a combination of wireless failover, out-of-band management and primary connectivity. Wireless internet failover is a cost-effective and scalable safeguard that protects internet connectivity and avoids lost revenue from service disruptions by providing business continuity in the event that the primary wired network fails. It’s also secure with strict measures in place such as PCI compliance for credit card security. Out-of-band management increases the efficiency and effectiveness of IT departments while cutting costs and increasing network uptime. IT staff can remotely manage and troubleshoot devices, effectively eliminating the majority of costly truck rolls (having technicians drive to affected sites). Primary wireless connectivity is often the best choice for business enablement in the case of ATMs, point of sale devices, digital signage and so on. It also offers in-vehicle connectivity to manage vehicle fleets and provides customers with WiFi access, as well as IoT connectivity for industrial monitoring where safety, security and regulatory compliance are key. Customizable: In order to provide customers with a custom wireless solution, Enterprise Connect now features router and accessory offerings from a whole new range of manufacturers, including Cisco, Cradlepoint, Encore, NetComm, Systech and more. Compact, hardened, and service-rich router variations are available in a variety of configurations to meet individual business needs. Powerful: Business owners also benefit from high-performance subscriber management and service delivery, with provisioning, billing and multimode access for M2M applications. Users get one-stop, multi-network subscriber management, up to four levels of account structure, smart alerts and automated operations to manage data usage, a mobile app and much more. Simple: Enterprise Connect also simplifies the process of router management. IT staff can monitor router statistics and data usage in real time, wirelessly manage firmware updates, configure hardware, produce reports and set automated alerts to avoid overage charges. Agile: Location service is another key feature, providing the ability to view the current device location on a map in the router manager dashboard. This is invaluable when device location may change over time, such as trailer or vehicle mounted solutions. For resellers, the router manager is now available as a white-label solution with custom branding. To learn more, schedule a meeting with us to see how our broad set of leading industrial IoT capabilities enables solutions that deliver total asset visibility, remote control and analytic insight.